* A different edition of the book (not the same cover) is seen in Juliet's flashback, on Rachel's nightstand. ("Not in Portland") See the image here. * Ben reads Carrie in his library for the forthcoming book club discussion, and complains that he finds it depressing. ("One of Us") This is again a different edition, the paperback edition. * Emilie de Ravin played the character Chris Hargensen in the 2002 television remake of Carrie. * Minor characters include Principal Henry Grayle (possible connection to Henry Gale)and Restaurant Owner Hubert Kelly, who "Complained constantly that his electronic pacemaker was on the verge of electrocuting him." * Damon Lindelof has referenced this book as a source of influence in LOST. * The Langoliers depicts a group of strangers who are on a flight that travels into a time rip, into a new dimension. 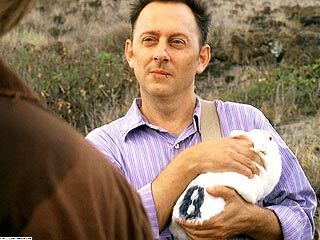 * The bunny theme in lost is an obvious reference to On Writing. In the nonfiction book, a writing exercise asks the reader to analyze an albino rabbit in a cage with the number 8 written on its back. A bunny with a number 8 on its back is seen in many episodes of Lost, along with other bunnies with either different or no numbers. * Minkowski mentions to Michael who was bouncing a tennis ball against a wall, about the scene in the film where the main charcter Jack bounced the balls against a wall before attempting to murder his family. The film was based on Stephen King's novel of the same title. * Producers say this is an influential book in Lost. Еи, браво за темата. Някои от посочените съм ги забелязал но други не. Якоо. Това със заека не го свързвах с Кинг, сигурно защото не съм чел книгата още.